The new Project Panel on the left side allows you to easily arrange your sheets hierarchically and drag and drop scenes quickly. The symbols before the name of an element indicate the type of the file. Sheets are displayed by two flat levels. If a sheet has scenes as sub-elements, the sheets are marked with a little drop-down arrow. Scenes are marked by a globe icon and time-travel scenes by a clock icon as shown in the figure above. If a 360° image is not placed on a sheet, the symbol is displayed in gray, for regular scenes as well as time-travel scenes. 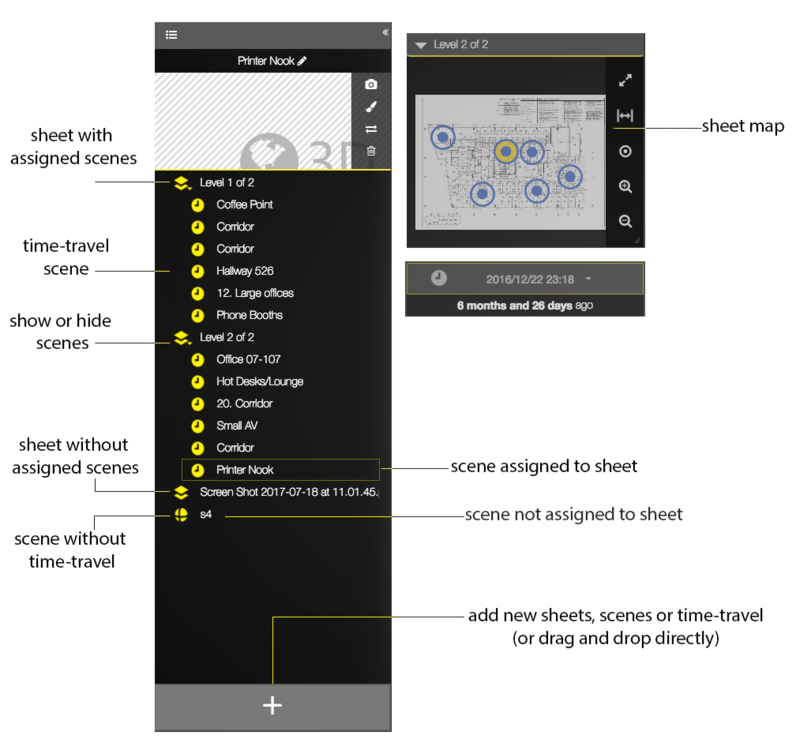 Easily add new scenes and sheets by using the + button on the bottom of the panel. The + button stays at the bottom of the Project Panel regardless of the number of overall scenes. Hence, even if you have a project with many scenes, you can still easily add new scenes without having to scroll to the bottom of the panel. Selecting the button opens a dialogue, in which you choose between adding scenes, sheets, and time-travel scenes. Another quick possibility to add new scenes is to drag and drop files from your computer directly onto the + button. Just select the corresponding files in your finder and drag them to the + button at the bottom of the panel. Afterward, the new scenes will directly appear at the bottom of the Project Panel list. It is only possible to add scenes this way, no sheets or time-travel scenes. Add filters like saturation, distortion, contrast, and face blurring to your 360° image. Combine any filters and test them with the live preview. Click on the paintbrush icon next to the scene preview to open the filter settings. Click on the trash bin icon to delete a scene or sheet.